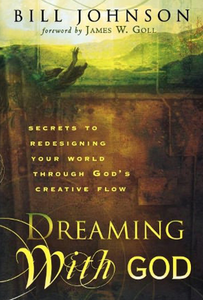 In 2006, Bill Johnson wrote a book called ‘Dreaming With God’. In this particular book, Bill Johnson reveals that he is part of the New Apostolic Reformation and is one of their leading apostles. Although we exposed Bill Johnson lying to ChristianityToday about his apostolic ties to the NAR, we found further proof in his book that Johnson knows full well that he is an apostolic leader within the NAR. Firstly, Bill Johnson is endorsed by NAR Apostle Rolland Baker, NAR Apostle Che Ahn, NAR Apostle Lance Wallnau, NAR Apostle/Prophet Steve Shultz, NAR Prophet Mark Chironna, NAR Prophet Stacey Campbell. Bill Johnson is a wonderful friend, a covenant brother, and a revivalist who is moving in extraordinary signs and wonders. He is also a mentor to me through his books and his revelatory teachings concerning the Kingdom of Heaven. I have no doubt that Dreaming With God will change your life as his teachings have impacted countless thousands. Source: Bill Johnson, Dreaming With God, DESTINY IMAGE: 2006. This confession of Che Ahn is very revealing. Only apostles in the NAR receive ‘revelatory teachings concerning the Kingdom of Heaven’. This is because NAR Apostles are also called ‘Gods Generals’, rolling out supposed ‘strategic level spiritual warfare’ revelations to lead the church to advance ‘Gods Kingdom’. So the fact APOSTLE Che Ahn is mentored by Bill Johnson’s revelations is another mark of Bill John’s NARpostolic leadership. The inspired Psalmist said, “the path of the just shines brighter till the perfect day.” When the Church breaks through to new revelation, the whole world gets enlightened. The Reformation produced the Renaissance, and 90 percent of the world’s inventions have been created since Azuza Street broke loose in 1906. As the Prophetic movement gathered momentum in the 1980s, another power surge occurred and knowledge began to double every seven years! Apostles are now bringing us into a rendezvous with “the perfect day” as men like Bill Johnson forge a path of revelation that is brighter with each book. As the world creeps into deeper darkness, torchbearers like Bill Johnson open portals to release the knowledge of the glory in language so tangible and accessible it can’t help but inspire end-time exploits. It certainly inspires me! NARpostle Lance Wallnau brings up how the ‘Prophetic movement gathered momentum in the 1980s’. He did not disconnect the Apostolic rise from the 198s Prophetic movement. This points again to Apostle Dr Brown’s denial of being a prophet or even being a part of the NAR. Back in December, Dr Michel Brown acknowledged that he, along with Rick Joyner, were “known as prophetic people, called a Prophetic Movement”. Michael Brown admits his NAR ties to Rick Joyner. Since Joyner and Brown see themselves as prophets in the 1980s “prophetic movement,” what do you think was the “power surge” that emerged from the prophetic movement? Dr Michael Brown’s ‘Brownsville Revival’ was one such power surge. And one particular NARpostle who came out of that movement was Bill Johnson. And not only does Michael Brown defend Bill Johnson, he also defends, and is in relationship with, NARpostle Lance Wallnau. For Dr Brown to claim he is not part of the NAR and to claim he is not a NARpostle is very deceptive to say the least. ‹ Clayton Jennings ‘skunks’ himself?